Members of the Criminal Justice Giving Project made history by being the first Giving Project to accomplish multi-year fundraising, and setting a record high of the most raised by a single Project! Together, the group ended their five month Giving Project by collectively raising $252,000 in gifts (including support from the Riverstyx Foundation) and making 11, two year grants, to some amazing grassroots organizations. We’re proud to announce grantees from our 2014 Criminal Justice Grant Cycle! The 2014 Criminal Justice Grant Cycle focuses on funding grassroots solutions that build capacity, and restore justice in our communities. The grantmaking process is led by our members through the 2014 Criminal Justice Giving Project. Through this Giving Project we examined the intersections of race and class in the systems that criminalize communities of color, and those living in poverty. Our grantees are working to address issues within the criminal justice system using a variety of community based approaches. Please take a moment to learn about their inspiring, and effective work. American Friends Service Committee (Freedom School, YUIR, EPIC) | Seattle, WA: The American Friends Service Committee’s Community Justice Program will use this funding for three connected youth initiatives: Freedom School, Youth Undoing Institutional Racism (YUIR), and End the Prison Industrial Complex (EPIC) campaign. The Freedom School focuses on building social consciousness and leadership skills needed to become critically engaged in community issues. Through Youth Undoing Institutional Racism (YUIR) the work of the Freedom School is transformed into an incubator for community engagement. The young people who are part of YUIR are encouraged to acknowledge their lived experience and inherent power, and to insert themselves in the conversation the city has about them. Initiated by the YUIR group, The End the Prison Industrial Complex (EPIC) Campaign is now a mutigenerational project with a focus on confronting the issues of racism and over incarceration in the King County juvenile justice system while proposing and advocating for alternatives to juvenile detention. Colectiva Legal del Pueblo | Burien, WA: Funding from Social Justice Fund will support Colectiva’s work with Families Organizing to Stop Deportations, a project formed in response to the Spring 2014 hunger strikes at Northwest Detention Center. Immigrant detainees organized the strike to demand better treatment, the opportunity to fight their cases from home, and an end to deportations. Families of detainees play a critical role in supporting the strike by acting as a conduit for communication, and by becoming public about their own struggles. Strikers’ families are connecting with other families and have expressed that their actions are for all immigrants. Catalyst For Kids Parents Advocacy Committee | Seattle, WA: Catalyst for Kids will support the Washington State Parent Advocacy Committee, a statewide committee of parents which is administratively supported by Catalyst for Kids. The Washington State Parent Advocacy Network is a statewide organization of parents who are “veterans” of the child welfare system. They have personal experience with Child Protective Services (CPS), first losing, then regaining custody of their children. Having reclaimed their own lives and families, they now advocate for parents entering the child welfare system. This entails peer advocacy that helps parents address barriers to safely reunifying with their children and policy advocacy that addresses the root issues underlying the barriers those parents face. The grant will support WSPAN organizing, leadership development, coalition building and policy advocacy. Idaho Community Action Network – ICAN | Boise, ID: Funding will further ICAN’s work to combat criminalization of immigrant communities using leadership development tactics, direct actions, legislative visits, educational forums, civic engagement work, and a rural strategy. In addition to other campaigns, ICAN’s families are fighting for social, racial and economic justice by supporting immigration reform. We are focusing on is the ever increasing criminalization of immigrants through the immigration enforcement system. ICAN’s goals include launching a Civic Engagement Campaign where we will register 2,500 new citizens and provide education on the issues facing our community. Through ICAN’s radio station we will fortify weekly programming with issue education of criminalization and build public support for all campaigns. ICAN will continue to build power for the Fair Licensing Campaign in preparation for the legislative session. This includes collecting 7,000 petitions, hosting educational forums, movement building and youth trainings, and creating coalitions with unlikely allies such as sheriff’s and insurance agents. We will also release a report that not only strengthens the economic and statistical argument, but elevates the stories of Idaho immigrant families. Incarcerated Mothers Advocacy Project | Seattle, WA: IMAP provides legal education to incarcerated mothers and engages incarcerated mothers in developing policy strategies to reduce the chances of family separation as well as incarceration of women in Washington State. This grant will support establishing and making sustainable, a currently un-funded and volunteer only project that organizes women in prison. The grant would support providing a leadership training for incarcerated and formerly incarcerated mothers in WA, by Women on the Rise Telling Herstory (WORTH), a New York based advocacy/consultant group comprised of currently & formerly incarcerated women. Indian Peoples Action – IPA | Butte, MT: IPA’s mission is to work in Montana urban areas, and border towns of several Indian reservations to organize for social, economic and racial justice. IPA is deliberate through its training and listening sessions to cross the boundaries of race and class among those participating. Indian People’s Action is organizing to address the practices that lead to a disproportionate number of native people being imprisoned in Montana and the poor treatment of Indians imprisoned and paroled in Montana. The goal is to organize for a state investigation to publicly expose the poor practices within the private prison and parole systems resulting in the termination of contracts and begin to build toward a commitment to creating alternative sentencing. Montana Immigrant Justice Alliance -MIJA | Helena, MT: The Montana Immigrant Justice Alliance (“MIJA”) is a statewide organization dedicated to giving voice to the immigrant communities in Montana and working to improve their lives over the long term. MIJA works to educate the public about our migrant communities, and provide services to empower these communities. Funding will be used to expand and continue our grassroots organizing, public education and advocacy efforts in the criminal justice arena. Montana is a small state and the funding will have a greater impact in Montana because it will affect the entire state rather than a large locality. Seattle Young People’s Project – SYPP | Seattle, WA: Seattle Young Peoples Project (SYPP) focuses on youth-led organizing and movement building in Seattle and greater Seattle area. They are working to build up Seattle’s capacity and knowledge of the School to Prison Pipeline (STPP) and best strategies to use during police encounters as well as direct actions you can take against police brutality. SYPP addresses root causes of the STPP by organizing towards institutionalizing Restorative Justice in two Seattle public schools as well as organizing to encourage Seattle politicians to shift laws. 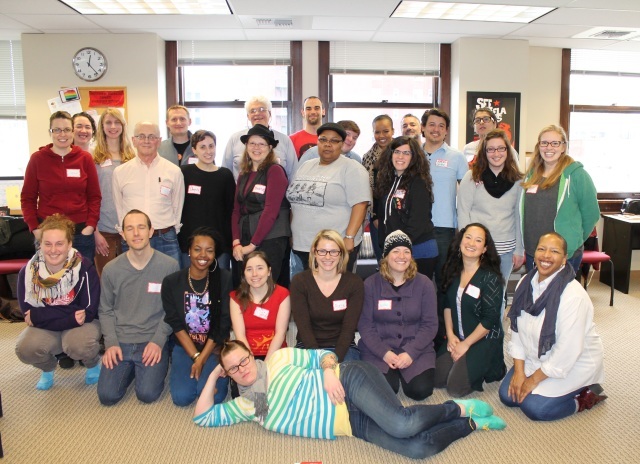 Statewide Poverty Action Network – SPAN | Seattle, WA: Funding from Social Justice Fund will support SPAN’s work to engage, train, and support people with low incomes and people of color statewide as they promote legislative and structural change. In particular, funding will support member-driven campaigns to: 1) enact comprehensive reform to Washington State’s Legal Financial Obligation (LFO) system that keeps people who have been incarcerated and their families stuck in cycle of poverty, and 2) tell the stories of people living in poverty and connecting them to policy priorities. Village of Hope – VOH | Seattle, WA: Village of Hope works in cooperation with other organizations and with elders, children, youth and adults to build and experience a strong, healthy community where people are liberated to live powerfully in every aspect of their lives. Their goal is to support leaders re-entering community who have actively participated in the Black Prisoners Caucus to connect and strengthen criminal justice organizing work in the community. VOH works closely with a number of organizations working to deconstruct the “womb to prison” pipeline using an anti-racist approach. Voz Workers Rights Education Project |Portland, OR: Funding will support local collaborative efforts within the Not One More Deportation Campaign, Activists Coming Together (A.C.T.) Network to end Police/ICE Collaboration in Multnomah County in Oregon, and mobilizing for Oregon Driver’s Card ballot in Oregon. Meet our Giving Project members! These grants were the direct result of our 2014 Criminal Justice Giving Project, a group of 22 volunteers who came together to begin a five month grantmaking process that included learning about race and class, systems of oppression, how to fundraise, and finally, how to collectively and democratically make grants to community based organizations. Together this group raised over $252,000 in gifts, went on 14 site visits, and reached 241 donors. The Criminal Justice Giving Project ended their Project by funding 11 community based organizations for two year grants, brining new resources to some of the most inspiring grassroots organizations in our region.